The processing of bone-lace has widely spread in Chioggia and it’s a tradition that continues through the ages and it’s considered, even today, an identifying element of the local culture. The manufacturing techniques of the bobbin lace were taught to the women since they were young; they worked all day at home, in the charities and in the educational institutions as long as the light permitted it. Thanks to the lace’s processing, the young women contributed to create their own dowry with manufactured clothes and products for the house; at the same time the laces production, which was later traded, represented a big help for the families’ subsistence especially during the poorest periods. By the end of the 18th century the political changes, which happened within Europe, had a big impact also on fashion, which became simpler and reduced the laces demand for clothing. Anyway, the art of lace continued to be practiced and to be passed down through generations. 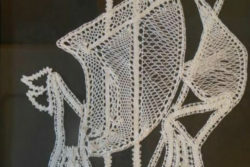 In the 19th century the technique of bobbin lace processing had an important development in Chioggia thanks to the educational care of the Canossians sisters of the Santa Caterina’s cloister, who opened a professional school for the young women which was organized in four apprenticeship’s sections for the lacemakers during the second half of that century. In the 20th century the lace art continued to be passed down from mother to daughter because it represented a contribution to the family economy and because it was considered an identity good which had to last. Today this activity is different from the past and it’s practiced through some groups and associations of people, led by competent teachers, who are regaining the values of work and art by showing them in exhibitions and events who are increasingly appreciated and attended.